The resources we offer are given to equip God’s people to be winsome, knowledgeable cultural missionaries at home, work, school or play. We offer: Seminars, Notes, Links and Speaking engagements. Our Seminars focus on cultural issues that either mute the voice of historic Christianity or distort its content. We offer these in Spanish as well. Our Notes are available online for both personal enrichment and as tools for making disciples. We only ask if you download anything that there’s no alteration of the source contents. Also give credit to whom it is due. Links are designed to expand your knowledge base. In America today, science is seen to hold the keys of knowledge, and “it is the most important influence shaping the modern world…” writes Christian philosopher J.P. Moreland and author of Christianity and the Nature of Science: A Philosophical Investigation. He continues and exhorts, “if the church is to speak to the modern world and interact with it responsibly, it must interact with modern science.” That is, the Church needs to understand the worldview under which science is operating, understand how language is used and rationally evaluate its truth claims. Our notes on Darwin, Design & Origins available in PDF format helps the Church do the aforesaid. Scripture affirms over and again that “Truth” is fundamental to the Christian faith. But we live in a culture where that notion is considered to be an illusion. We’re told that there are no “Absolutes” only personal preferences, and one’s view of ultimate reality is equally as valuable as the other. But is that view true? 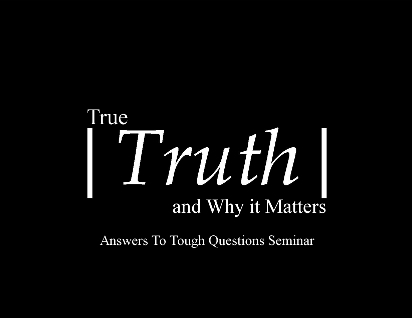 Our notes on True Truth and Why it Matters answers questions like: Is There Such a Thing as Truth and Can it Be Known; What are the Enemies of Truth? Why Do People Believe vs. Why Should People Believe? And much more. Whenever anyone asks, “How do we know that God exists?” coming to terms is critical for fruitful conversation (I.e., mutual understanding) to occur. In our society today people rarely ask for clarification of what is meant by “God”. Unwittingly Christians may assume a friend is using the term “God” as a referent to the God of Scripture while conversing but it’s a referent to nature. 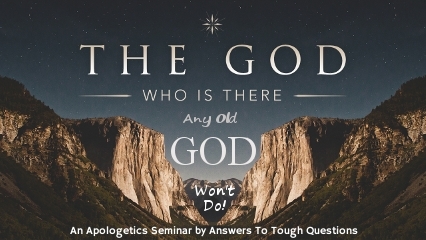 In The God Who Is There: Any Old God Won’t Do these notes consider: What a worldview is, Differing Views of God, and Three Ways of Arguing for God’s Existence.